The Swisscubing Cup 2019 consists of six competitions all around Switzerland. During the course of the Swisscubing Cup 2019, each WCA-Event will be hold at least twice. 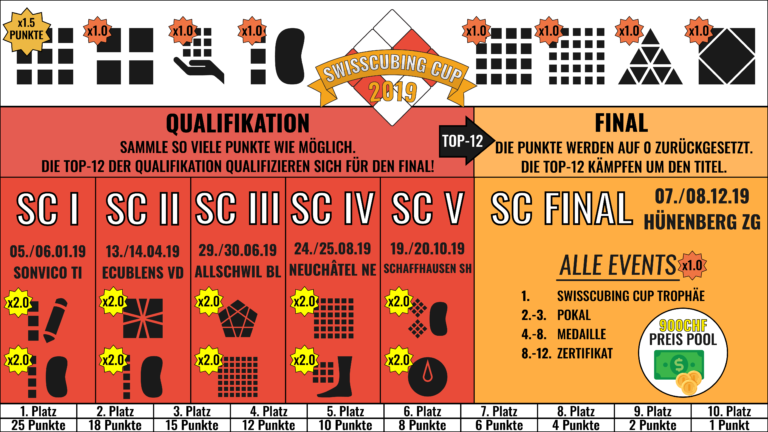 The competitors placements will be summarized in a point-system and this results in the Swisscubing Cup 2019 ranking. The tournament is divided into two phases. The qualification and the final. The five competitions before the final are the qualification. In the qualification phase competitors gain points, and the best 12 competitors qualify to the final. In the Swisscubing Cup Final 2019 the best 12 competitors compete to win the title. If somebody from top-12 can’t compete, the next competitor will replace them. Since the final is also a WCA competition, everybody is allowed to compete, but only the finalists can win prizes.